While Android (s goog) and iOS (s aapl) continue to control the top of the smartphone market, we keep wondering when an ascendant third-place challenger will appear. New data from Nielsen (s nlsn) helps explain why placing a strong third may be tough. Nielsen says in the U.S., Android and iOS account for 71 percent of all smartphones in use, which leaves little room for competitors. But among smartphone users who downloaded an app in the last 30 days, the competition is even more lopsided: 83 percent used either an iPhone or Android. On a surface level, this might seem intuitive considering how many apps are available on the two platforms. But the figures show that the top two operating systems account for a bigger chunk of app downloads than their relative footprint would logically suggest. 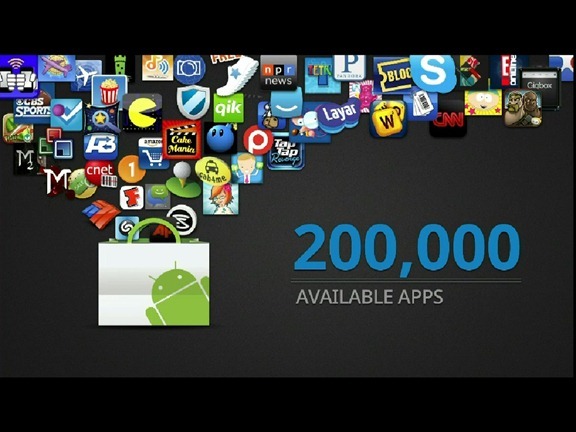 Competitors also have apps, but these two are the leading destinations for people who are eager for mobile software. That shows why it’s hard to break into the top of the smartphone market, which is dominated by what the New York Times‘ (s nyt) David Pogue calls “app phones.” It’s not enough to have elegant hardware; you have to bring a very vibrant and broad app market to consumers, too. That’s partly why iOS and Android are sitting pretty: They offer a lot of very compelling apps that make money for developers, more so on iOS, but increasingly so on Android. For competitors like BlackBerry (s rimm) or Windows Phone 7 (s msft) to compete, they need to really bring the app heat as well. Both are working hard on doing so, but it’s hard to close the distance when iOS and Android have such a lead. That lead also benefits Google and Apple through app lock-in, in which consumers may be reluctant to leave a platform because they have a lot of apps and data tied into one operating system. Getting someone to switch to a new platform requires a big commitment from a user, who has to know that the apps they want will be waiting for them on a new platform and that the transition, which may involve losing data, will be worth it. Of course, the app market and the growth of the platforms are somewhat intertwined. Developers like to place their bets on the biggest and most profitable platforms, and a big library of apps can help sell a platform. For someone who’s starting behind on apps, or whose device sales are fading or sluggish, it’s tough to break that cycle after it’s well under way. I think Windows Phone 7 probably has the best shot at escaping the downward spiral and gaining some momentum, but looking at the competition through the lens of the app advantage, I think it will be a harder road for Microsoft than the rosy projections painted by Gartner (s it) and IDC, who predict WP7 displacing iOS by 2015 as the chief rival to Android. 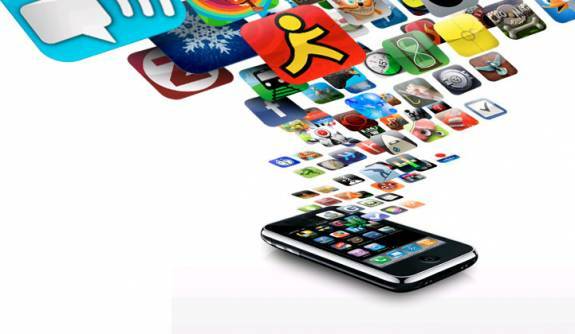 The app ecosystem is a key factor to achieving that uptake. Nokia (s nok) chief Stephen Elop said as much when he announced the move to Windows Phone 7 for Nokia smartphones was led by the need to compete on ecosystems. But I think it’s tough to keep building that ecosystem when you’re not selling many phones. Nokia’s introduction of new phones will certainly help, but consumers are still going to see more apps on Android and iOS. And developers are going to need to see a lot more momentum before they really support WP7. There is hope for WP7, based on a recent Appcelerator/IDC developer survey, which found WP7 was pulling away from BlackBerry as the third most popular smartphone option for developers. WP7 will also have to vie for developer attention with the Kindle Fire (s amzn), which is now the top Android tablet in the minds of Appcelerator developers. I still hope we’ll see more than just a two-horse race in smartphones. 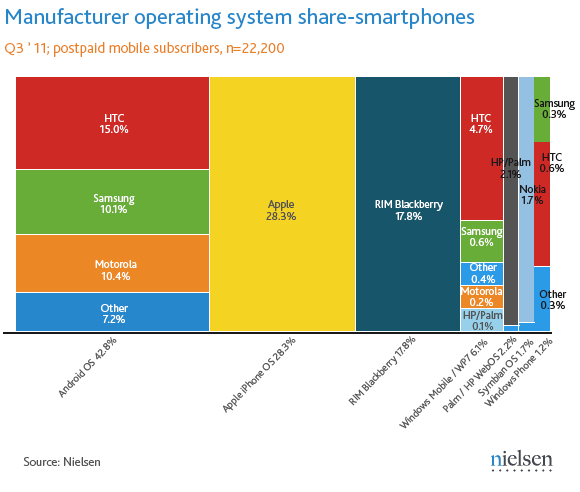 And it’s certainly possible we will see WP7 and BlackBerry rise to the challenge. But they’re going to have to offer competitive app marketplaces for consumers and developers. The emergence of HTML5 web apps might offset some of the existing advantage, but even if it does, it will likely take a while to really get going. For now, Android and iOS, with their app advantage, are enjoying the view from the top, without much fear of tumbling from their perch.